A new Metal Twisted G-Shock (MT-G) watch is due for an October release, the all-new G-Shock MTG-G1000. Model numbers are the MTG-G1000D-1A with a black face, the MTG-G1000D-1A2 with blue accents, and the upcoming black and gold MTG-G1000GB-1A. 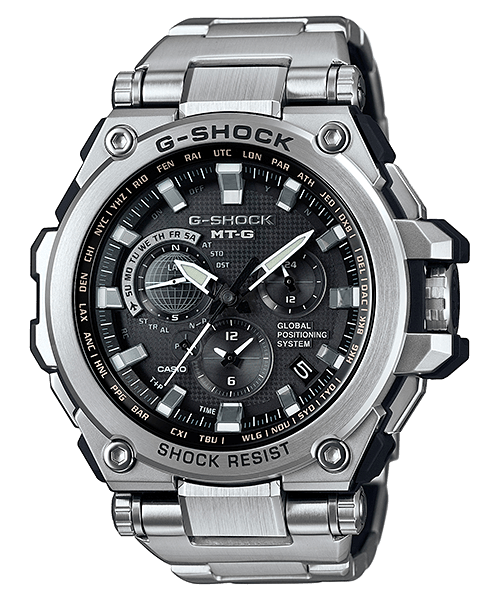 The new G-Shock model is an upgraded version of the MTG-S1000 with the GPS Hybrid Wave Ceptor feature added and a similar yet unique exterior design. 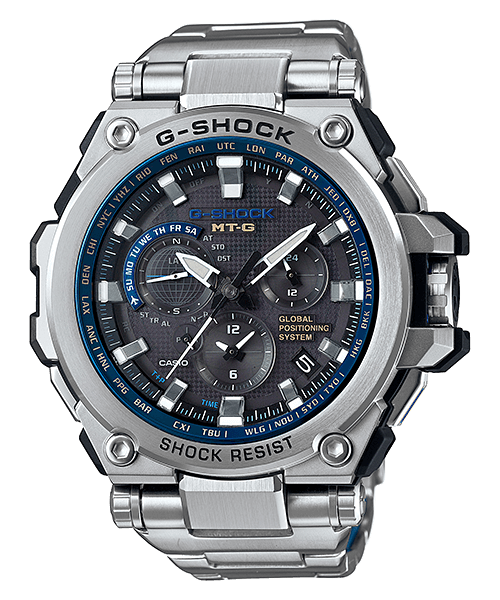 The MTG-G1000 is the third G-Shock behind the GPW-1000 Gravitymaster and the MRG-G1000 to have the GPS hybrid technology. This feature combines Multi-Band 6 radio wave timekeeping with GPS satellite signal reception to provide accurate time syncing and time zone adjustment anywhere in the world. Like the MTG-S1000 the MTG-G1000 has a sapphire crystal with anti-glare coating and Triple G Resist for resistance to shock, centrifugal gravitational force, and extreme vibration. It also has a core guard structure which incorporates resin and Alpha Gel to protect the module. A new feature is the the six o’clock subdial’s dual coil motor that allows high-speed hand movement so you can easily switch between home time and local time by pressing a button. The hour and minute hands are made of carbon fiber and certain parts of the case and bezel feature Sallaz Polishing which provides a stunning mirror-like finish. The MTG-G1000 is expected to have a list price of $1,500, making it the second most expensive non-limited edition model behind the MRG-G1000. G-Shock Japan has officially announced the MTG-G1000 on and have a web page dedicated to the new model. The release date is September 18 for Japan. The MTG-G1000D-1A and MTG-G1000D-1A2 are currently listed and the Japanese list price is 160,000 yen. 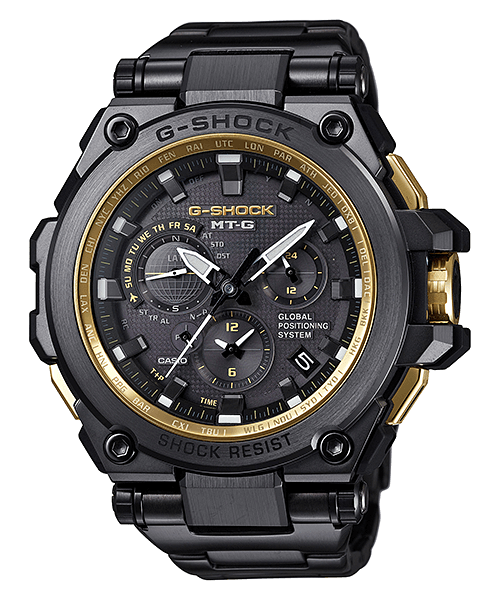 The black and gold MTG-G1000GB-1A is expected to be a special edition November release. Silver stainless steel exterior with blue ring dial and accents. Silver stainless steel exterior with black and silver display. The MTG-G1000GB-1A is a Black and Gold edition with a black ion-plated exterior, gold buttons and crown, and a gold IP dial ring. The watch has a diamond-like carbon (DLC) treatment including the band clasp to protect against scratches. G-Shock Japan announced a December 2015 release. Casio America announced the MTGG1000GB-1A with a list price of $1,900 and availability in January 2016.